Starting about two weeks ago, all the hay was cut down and rolled into giant bales. 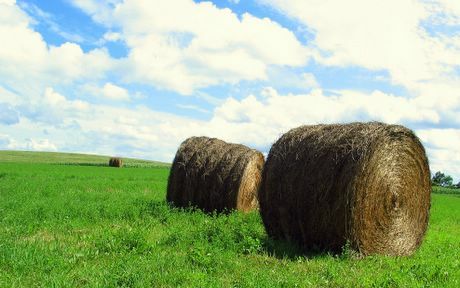 I did a bit of reasearch on these bales and discovered a few interesting facts: Rolled hay bales are becoming more popular because they are less labor-intensive to make. But they are huge and heavy and don't stack well, so they are usually left out in the field til they're needed, and more hay gets wasted as a result -the outer layers deteriorate or the cows nibble away at them. Also they are dangerous - quite a few farmers have been crushed by falling round hay bales because they are so heavy! WOW! It's almost a Monet painting! Yea... but its really bad for the cows. They can't get a square meal anymore!!! There you go, a bad joke to go with your nice shot! I LOVE this photo. In France now they wrap the stacks in black plastic (to protect them from the rain I suppose) and it's awful. The colours are really stunning here. This is a great shot Jenny! The colours bounce everywhere. After reading your post, I imagined Scarecrow (Oz) rolling about not knowing he was scaring the cows and mowing down farmers. This photo appeals because of all the colors. The two bales are positioned for maximum effect. I often wonder why these objects capture our attention as they do--perennial favorites! Wow, a comment from Eric - I feel like a celebrity has come to visit :) Very funny, juggerpix! A nice photo and a good joke to go with it, plus a visit from the Founder. Very succesful post. Hay, Jen! (Sorry, I'll get me coat! )Here you have another candidate for the next Microsoft op.system image. Personally, I think they should go for something different & use the Gt Barrington Por La Noche' shot. No Cow Parade? The grass looks delicious. You are doing great! Very good shot.. the lens is very very sharp and the depth of field is amazing! Nice photo. I posted a similar one a couple weeks ago. Nice research on the bales as well.